Jeanne White-Ginder visited her son, Ryan’s, grave this week and posted this picture above to Facebook. Friday, June 30, 1985 marked 32 years to the day when Ryan was denied admittance into Middle School because of his HIV status. It’s a moment that changed his life and his family’s life, and it’s the event that eventually introduced him to the world. Ryan made the world a safer place for everyone with HIV, and his call for education was a game-changer in the United States- and it was a message that was shared around the world. The Ryan White Care Act continues to help people today, and it’s a fitting tribute for such a kind-hearted, inclusive advocate for everyone living with HIV. You are not forgotten, Ryan. And Jeanne White-Ginder- who was instrumental in the passage of the Care Act- has been a wonderful light, sharing his story with grace and changing lives in the process. 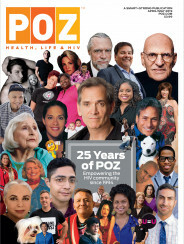 For more milestones in HIV/AIDS history- and to share your own personal ones- visit the #AIDSisEveryday section on POZ. Are HIV Suppression Rates Similar Under Ryan White, Medicaid, Private Insurance?